Put Bordeaux at the top of your travel bucket list, here are our top 5 reasons to travel to Bordeaux. THE WINE!For centuries France has been a hub of viticulture and wine winemaking. Bordeaux is the largest wine making region in France, both in terms of volume and quality. It is most famous for it’s prestigious Chateaux and expensive age worthy wines. Many overlook this region’s more affordable finds. It has a moderate maritime climate that benefits from its proximity to large bodies of water to help ripen grapes. The region is very wet, therefore rot and under-ripening can be a problem in some years. Seeing as Bordeaux is home to a variety of white and red grapes, the winemaker is able to more easily obtain a balanced wine by blending- even in the face of a challenging vintage. Each grape varietal is suited to a particular soil and adds something unique to a Bordeaux blend. Try bold red wines from incredible estates! THE FOOD!The French do not mess around when it comes to the finer things in life. That said, to eat a la Bordelaise is notch or two higher. Think fresh seafood, delicious baked goods and rich foods like bone marrow, tender meat and confit. THE HISTORY & CULTURE!From Gothic architecture to stunning museums, country homes to 18th century museums there is something for everyone here. The City of Bordeaux is also now a UNESCO World Heritage Site. THE WINE (Part 2):We forgot to mention but Bordeaux is also home to some of the most famous sweet wines in the world! Sauternes is a French sweet wine from the Sauternais region of the Graves section in Bordeaux. Sauternes is made from Sémillon, Sauvignon blanc, and Muscadelle grapes that have been affected by Botrytis cinerea, also known as noble rot. This causes the grapes to become partially raisined, resulting in concentrated and distinctively flavored wines. Due to its climate, Sauternes is one of the few wine regions where infection with noble rot is a frequent occurrence. THE SCENERY: Caressed by Atlantic breezes, the vineyards that cover the rolling hills along the rivers of Aquitaine are just beautiful. Scope out historic buildings and immerse yourself in the rich history of Bordeaux. Sound good to you? Join us on May 24 2018 and celebrate joie de vivre in this land of wine and oysters, truffles and cognac, as you cruise the Dordogne & Garonne Rivers. Dine with your own Sommelier and wine pairings each night. This trip is a must for anyone interested in the best of French culture, lifestyle, wine and food. Learn more here. Book before 2017 ends and the entry level cabin will be $3834 instead of $4834 – save $1000! Did we miss anything? Tell us what you love about Bordeaux on Twitter, Instagram or Facebook. Jenny’s love of food, craft beer, wine, and people has taken her around the world. Day to day, you’ll rarely find her without her notebook and a to-do list. Jenny manages the Bishop’s Cellar brand, community and all our marketing endeavours- drawing on her extensive experience in community engagement, major event/festival management and freelance writing. She aims to find, craft and share incredible behind-the-scenes stories for every bottle on our shelves. When she isn’t cooking up new marketing strategies, managing the Bishop’s Cellar eCommerce or bringing fun events to life for Bishop’s Cellar, you’ll find Jenny in the kitchen with family and friends, running around in the great outdoors with her dog or planning her next travel adventure. 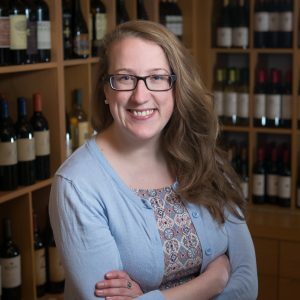 Certifications: Jenny is a CAPS-certified sommelier and WSET Level 3 certified. She’s always on the hunt for perfect food and wine pairings.